There’s nothing like a good haircut to make you feel spiffy and ready to take on the world. And there’s nothing like being around dedicated volunteers using their skills to make a difference. Put them together, and you get Haircuts with Heart, a group of hair stylists, barbers, and manicurists who provide free haircuts and manicures to people in need – people like the homeless veterans in our programs. On May 21st, Haircuts with Heart transformed our community room at House of Dignity in Oakland into a mini-salon, complete with mirrors, hair gel, and a selection of combs and scissors. Over several hours, they provided haircuts and/or manicures to 19 veterans, bringing a little old-school barbershop style and socializing to our community. 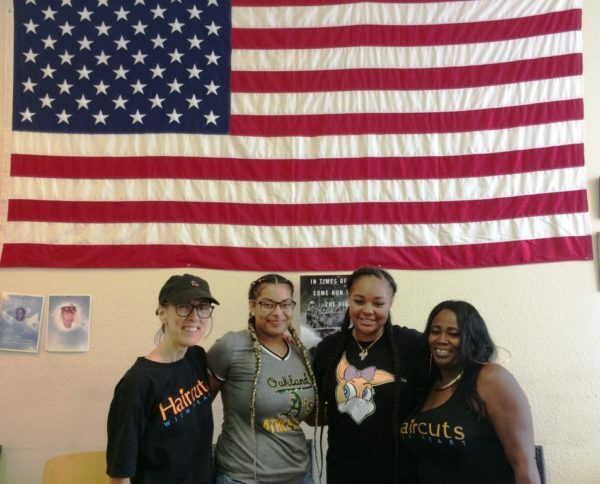 Thanks so much to all the Haircuts with Heart volunteers for their wonderful service, and for making the veterans at our site feel so cared for!